Each Echelon Reference Series title comes in two versions. The “PRD-Only” version has all the content from the Pathfinder Reference Document at the time of release, and the “3pp+PRD” version contains the same, plus additional content from select third-party sources. 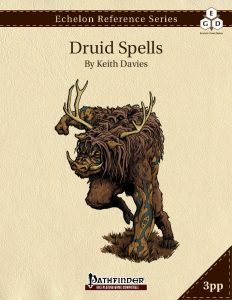 All “3pp+PRD” titles come with the “PRD-Only” version as a supplementary PDF. Echelon Explorations titles are much less rules-oriented than the others product lines. They are largely focused on world building activities. 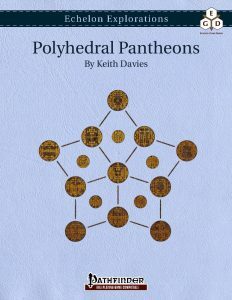 Polyhedral Pantheons is focused on the creation and development of a pantheon of related deities. Other titles are in the queue, including works on creating and developing cities, dungeons, and entire planes. Echelon Expansions titles provide player options, often expanding on or changing existing rules. 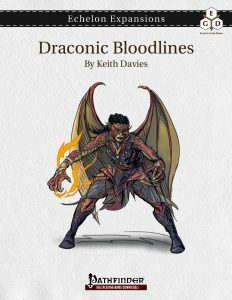 Draconic Bloodlines takes the sorcerer’s draconic bloodline from the Pathfinder Roleplaying Game Core Rulebook and adjusts it for each of the twenty-five dragon types in the first four bestiaries. Each dragon type has its own bloodline, with a modified spell list and a few of the bloodline powers changed to be more representative of the ancestral dragon type. Other bloodlines products are in progress, for fey and the various outsider types. There is also a book on hybrid domains in the queue. 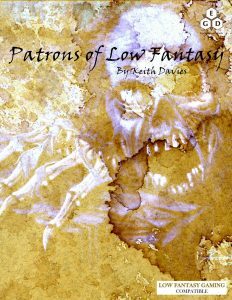 The titles in this series expand on and develop ideas for Low Fantasy Gaming, published by Pickpocket Press.